To partially disable VSA functionality/ features, press and hold it until you hear a beep. The traction control stops fully functioning, allowing the wheels to spin more freely at low speed. The VSA OFF indicator will also come on and a message on the driver information interface* informs you that the mode is changed. To restore VSA functionality/features, press the (VSA OFF) button until you hear a beep. With the button pressed, your vehicle will have normal braking and cornering ability, but VSA traction and stability enhancement becomes less effective. In certain unusual conditions when your vehicle gets stuck in shallow mud or fresh snow, it may be easier to free it with the button pressed. 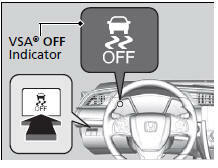 When the button is pressed, the traction control function becomes less effective. This allows for the wheels to spin more freely at low speed. You should only attempt to free your vehicle with the button pressed if you are not able to free it without. Immediately after freeing your vehicle, be sure to press the button again. We do not recommend driving your vehicle with the button pressed (indicator on). The VSA OFF indicator may come on after reconnecting the battery. Drive a short distance at more than 12 mph (20 km/h). The indicator should go off. If it does not, have your vehicle checked by a dealer.